System that captures the energy of natural IONS to rebuild, repair and re-texturize the hair. Bio Ionic Professional Hair Care System utilizes technologically advanced Natural Ion Complex to deliver natural negative ions to the hair. 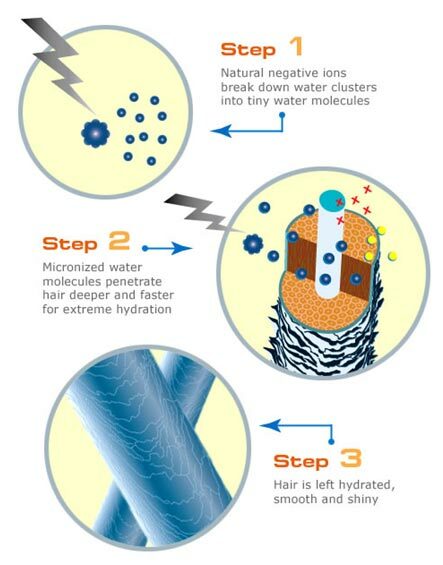 Natural negative ion energy is powerful enough to break water molecule clusters into micro-fine particles (atomization) and penetrate the hair shaft. That means moisture balance is restored and the hair cuticle is sealed. The results achieved with Bio Ionic Professional Hair Care System products are immediate. The hair is renewed, repaired and revitalized for a softer, smoother, shinier finish. Be used on any hair type, including hair that has been bleached, coloured or chemically relaxed, along with African/American hair safely and effectively with the right training. Whilst the Bio Ionic NIC-Retexturising System is revolutionising hair on a permanent basis, the Bio Ionic range of patented haircare products is perfect for using on 'regular' hair. And in fact anyone who has bleached or coloured hair will find that the Bio Ionic products are by far better than anything else they are currently using. Celebrities and models often have dry, damaged and stressed hair due to the amount of work that is done to it and it is this type of hair that responds brilliantly to Bio Ionic products. Kerry Warn, Australia's own hairdresser to the stars, including Nicole Kidman, uses and recommends the Bio Ionic products to his clients. Ions are atoms that have gained or lost an electron and bear a charge of energy. Positive ions have lost an electron and are considered unhealthy. They are found in dust, smoke and other toxic substances. Negative ions have gained an electron and greatly assist in a body's mood, energy level and overall health. Bio Ionic hair care products contain Natural Ion Complex™ (a blend of 32 natural-occurring minerals) that emits Natural Negative Ions in to the hair. Natural Negative Ion energy is powerful enough to break down clusters of water molecules into fine particles that penetrate the hair shaft, to re-hydrate, re-condition and restore moisture balance. After using the Bio Ionic product system, hair feels smooth, super-soft and looks silky-shiny.